This week you will be doing examining real life SN1 and SN2 reactions to see first hand the effects solvent, sterics (1°, 2°, or 3° substitution) and temperature have on reaction rates. The concepts are the same you learned in CH 8 of Carey. I’m going to review those concepts and then go into what you will do this week in lab, and what you should expect. The Big Difference Between SN1 and SN2: Do You Get a Carbocation? Although there is sometimes confusion about the differences between SN1 and SN2 reactions, you should know that they are essentially the same reaction: in both cases, the carbon-leaving group bond is broken, and a carbon-nucleophile bond is formed. What’s the difference then? Simple: In an SN1 reaction a carbocation is formed: the LG takes off and then the Nu attacks. In an SN2 reaction no carbocation is formed: the LG takes off as the Nu attacks. All of the differences between SN1 and SN2 reactions stem from these two facts! Let me rephrase what I just said: Most of the differences between SN1 and SN2 reactions relate to carbocation formation. Factors that are good for carbocations are also good for SN1. Factors that are bad for carbocations are also bad for SN1 tend to favor SN2. Note: Don’t worry, this is the longest explanation. The others are much simpler. In an SN1 reaction the first step is the formation of a carbocation. Tertiary carbocations are more stable than secondary carbocations, which are more stable than primary carbocations (3° is better than 2° which is better than 1°). So for this reason 3° alkyl halides undergo SN1 reactions faster than 2° alkyl halides, and so on. On the other hand, in SN2 reactions the nucleophile attacks at the same time as the leaving group leaves: a bond is being formed as a bond is being broken. So there is a lot of “action” going on around the carbon- carbon normally has four bonds are it, but in this case five bonds are around it. The carbon gets crowded. So to because of crowding, SN2 reactions work best on the least substituted alkyl halides: 1° is better than 2° which is better than 3°. The effects of crowding are also called steric effects (or just sterics for short). Protic solvents are capable of hydrogen bonding. 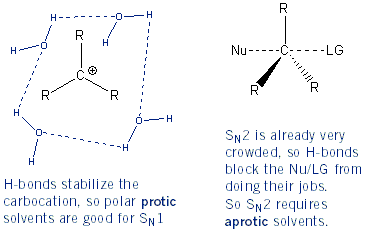 Carbocations are stabilized in solvents that can hydrogen bond, and so SN1 reactions proceed best in polar protic solvents. Conversely, hydrogen bonds aren’t good for SN2 reactions because they create a “net” around molecules. This blocks the nucleophile from entering and the leaving group from leaving the molecule. For this reason SN2 reactions work best in polar aprotic solvents (solvents that can’t hydrogen bond). What does it take to hydrogen bond? A hydrogen atom directly attached to an oxygen, nitrogen, or fluorine atom. Below are common protic and aprotic solvents. Temperature is a term to describe the average kinetic energy of a system- how fast molecules are moving. The higher the temperature the more often molecules will bump into each other and so the more likely a reaction is to happen. Also, a higher temperature means the system can more readily overcome the activation energy (Ea) required to start the reaction. So the rule is as you increase temperature reaction rate increases. Around room temperature, every 10 °C increase approximately doubles the rate of reaction. 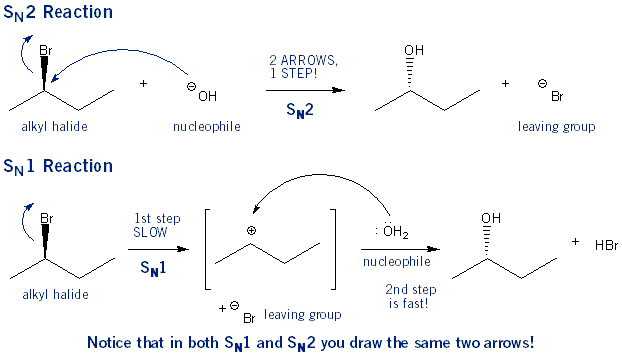 It’s a little confusing that SN1 reactions occur in two steps and SN2 reactions occur in one step. This is because the numbers in SN1/SN2 stand for how many molecules are important, not how many steps there are. In SN1 reactions only the concentration of the alkyl halide is important. Adding more nucleophile won’t speed up the rate of reaction. This is because the nucleophile doesn’t get involved until after the slowest step (carbocation formation). SN1 stands for substitution nucleophilic unimolecular. 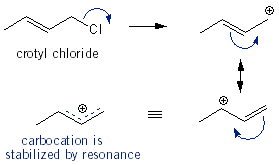 In SN2 reactions both the concentration of the alkyl halide and the concentration of the nucleophile is important. Increasing either will speed up the reaction. This is because they are both involved in the action step. SN2 stands for substitution nucleophilic bimolecular. Simple rule: the better the leaving group is, the faster the rate of reaction will be. Weak, stable bases are good leaving groups. So I- is better than Br-, which is better than Cl- etc. In this experiment you will test the effect of sterics (1°, 2°, or 3° alkyl halide) has on reaction rate, in both SN1 and SN2 reactions. The marker for this reaction is the formation of a precipitate. If you see a solid form than a reaction took place. You’re going to setup two sets of five test tubes, each with ~0.2 mL of alkyl halide. The first five will be for SN1 and the second for SN2. To each test tube in the SN1 set, you will add ~2 mL 1% ethanolic (EtOH) AgNO3 solution. To each test tube in the SN2 set, you will add ~2 mL 15% NaI-acetone solution. After you add the NaI or AgNO3 measure how long it takes to see a precipitate form. You will find that for SN2 n-butyl bromide and n-butyl chloride react right away. sec-Butyl chloride and crotyl chloride will react after a few minutes, but you’d be there all day waiting for tert-butyl chloride to react. For SN1 tert-butyl and crotyl chloride react the fastest because they give the most stable carbocations. sec-Butyl chloride will react after a few minutes, and the primary alkyl halides won’t react at all. In this experiment you will test the SN1 reaction rate of tert-butyl chloride with water in different acetone-water solutions- 55:45 acetone-water, 60:40, 65:35, and 70:30. You’ll find that one of the middle ones (60:40 or 65:35) gives the fastest reaction rate. Why in the middle? Because tert-butyl chloride is insoluble in water, but soluble in acetone, so you need some acetone for the reaction to work. But since acetone is a polar aprotic solvent, and SN1 requires a protic solvent, too much acetone is bad too. You’re going to setup a test tube for each solvent mixture you will be testing (~4 test tubes). In each tube add 2 mL of solvent, 3 drops of 0.5 M NaOH solution, and 1-2 drops of phenolphthalein indicator. Place the tubes in a water bath that’s around 30 °C. Once the tubes are warm, add 3 drops tert-butylchloride to each and measure how long it takes for the reaction mixture to turn clear. One of the solvent systems will turn clear in 5-10 minutes. This is the one you will use in part C.
You’re going to do the same experiment you did in part B, only at 40 °C and at 20 °C (room temperature). Let’s say that the 60:40 acetone-water solvent system took 8 minutes to turn clear in exp. B (30 °C). Then this would be the solvent system to test in exp. C at 20 °C and 40 °C. You’ll find that at higher temperatures the reaction turns clear faster. You will use your data to calculate the activation energy of this reaction. I gave a sample calculation below. You’re going to convert the temperature to Kelvin and the time into seconds. 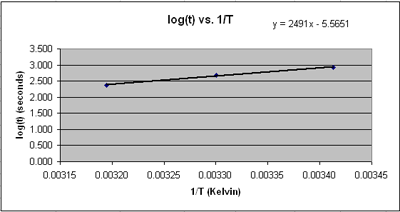 Then you’re going to plot log(seconds) vs. 1/T.